Whether or not you have been hitting the beach or pool, these fab items will make you feel like you’re on a beach vacation. Win essential goodies like a chic Trina Turk for Banana Republic towel and lots of products for before and after sun care from brands like Scott Barnes, Fekkai, Urban Decay, L’Occitane, Revlon, Vichy and more! 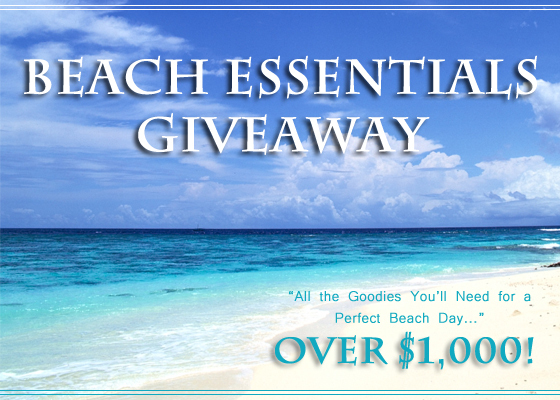 Our Beach Essentials Giveaway includes products valued at over $1,000! *Entering this contest will automatically subscribe you to PageDaily emails offering tips, tricks and product picks of celebrities and experts. If you are already subscribed, you can still enter this contest (you will continue to receive our emails and not be resubscribed). Not sure how to enter if you are already a subscriber. I shared it on Facebook and Twitter. Hope that entered me, I’d love to win this! I am a current email subscriber. Hopefully that means we are automatically entered, yes? I would love to win this giveaway as we live on the lake and all of my family and friends would benefit from all the glorious products Id receive when they come to our home. We have a constant flow of guests here! Thank you so much for the chance to enter. I am very fair-skinned and don’t go anywhere near a beach, but I do like nice products for my skin. I would LOVE to win the products and share them with my niece, who loves being out in the sun. How do we enter? Since I’m not taking an official beach vacation this year, I’d love to win a goody bag that will make me think I am! Not clear on how to enter this. What a great contest! Fingers crossed! Great contest. Count me in, please. Thanks! I can’t figure out how to enter. Please help! This is a fabulous giveaway!! I hope this is how you enter…. not quite sure!!! Anyway… Thanks! If you’re a subscriber, you’re automatically entered! Please share with your friends on Facebook and Twitter! If you’re a subscriber, you’re automatically entered! Please share with your friends on Facebook and Twitter. Just subscribe to our daily newsletters and you will be automatically entered. Please share with your friends on Facebook and Twitter as well! I’m already a email subscrider. Please share with your friends on facebook. What a FABULOUS and extremely generous giveaway. Good luck to all! Thank you for awesome giveaways!Would love to win!Iam already email subscriber. I’d like to enter, I’m already an email subscriber! Thanks! Great contest. Count me in, please. Thank you! I love all of these items!!!! This website always introduces some of the most useful items. I hope I win!!!!! Entered and shared this contest on my facebook page, kleimanlaw. Thank you so much for giving your fans the opportunity to win such fabulous prizes. Good luck to all.